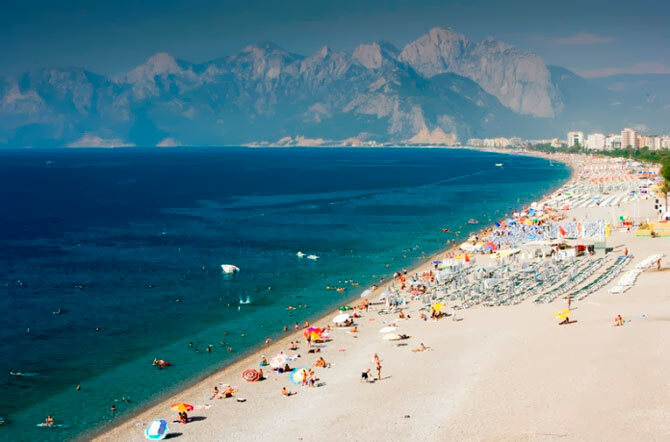 This lovely Turkish beach is located 8 kilometers from Antalya. It is the closest resort to the airport, so it is always visited by a huge influx of tourists. Because of its infrastructure, the purity of the water and the coast, the beach is Lara got the mark «Blue Flag», which is a worldwide mark of quality rest. It is completely covered with yellow sand, the grains of sand are quite large, so sometimes a bit strange to walk on it. However, after a few hours, tourists will not notice the difference. Lara is open for visitors around the clock. The beach itself is divided into several zones, which allow to rest on the organized beach for a small fee or for free towel and an umbrella. Now that you know about the best beaches in Turkey, make a selection to your taste, and spend an unforgettable vacation!